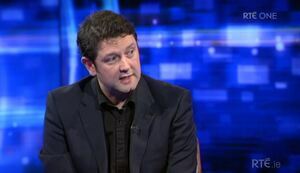 Last night Mr Mooney, who broke the GSOC bugging story last Sunday; Padraig MacLochlainn, Sinn Féin Donegal TD; Michelle Mulherin, Fine Gael Mayo TD; and Mark Kelly, director of the Irish Council for Civil Liberties, appeared on RTÉ’s Late Debate with Audrey Carville last night to talk about the story. During their discussion, Mr Mooney set out to explain what he believed was behind the surveillance, while also accusing the Fine Gael/Labour coalition of trying to cover up the story. John Mooney: “This whole matter goes back to a collusion investigation, a Garda Ombudsman Commission investigation going back a number of years, I was actually involved in it. Actually, I suppose to quote Enda Kenny, when he was in Opposition, saying – this was the Kieran Boylan affair – where he was demanding that the Government of the day provide explanations: ‘I want to give the Government…to give a full explanation of these cases, I will be tabling questions on the nature of the inquiry into both Boylan and why he isn’t before the courts when he was caught with large amounts of drugs, heroin and cocaine’. This was a drug trafficker who was working with a group of guards in the Dublin area, who served their way to promotion on the basis of turning a blind eye to these activities, in return for setting up people, including very young men in the Dublin area for arrests, and GSOC were in the middle of a very, very sensitive investigation into that which revealed all sorts of wrongdoing and all sorts of what could only be described as corruption within the intelligence services. And this particular escapade or what’s been happening, to the Commission, followed on, as they were drawing to a close, their big, public interest inquiry into this. And there were various people within the State apparatus who were desperately needed to know what they knew. And if you’re asking me, and it’s a very well-informed opinion, this is what this is all about. To be perfectly frank, I’m astonished at what’s going on in Government level. I remember Pat Rabbitte, when he was a justice spokesman in Opposition, screaming from the rooftops about Kieran Boylan getting given a haulage licence on the basis of false documentation and information to the Department of Transport. I remember when this individual, whom I should say whose associates were issuing threats against myself and others, was being brought up and being charged, and then the charges would be dropped secretly and then recharged again and again charges dropped secretly in discreet manners, to try and get this man off because he has so much dirt on the guards. There was a lot of, there was a lot of people at risk over what had happened, because this all totally contravened the new rules that were brought in, following the Morris Tribunal. And I am actually astounded at what’s happening in Government at this level. 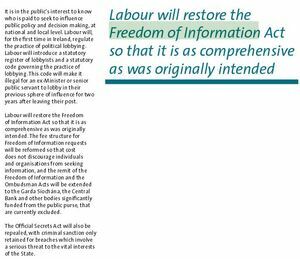 Brendan Howlin himself, I was a witness in the Morris Tribunal, I’ve done a lot of work in security issues in the last 15 years, Brendan Howlin was one of, I remember he played a very noble role in exposing what happened there. And the silence of the Labour party in this matter is absolutely deafening. How anyone, at all, could suggest and you know, I’m just, I’m just speechless at these kind of defences that ‘well nothing can be proven’. 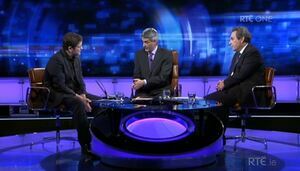 Simon O’Brien was very categoric tonight [last night] right. Mooney: “I’m not so sure that Alan Shatter is being so forthcoming, again ‘baseless innuendo’, given the security report has stated and what he published in the Sunday Times. It’s quite clear this isn’t baseless innuendo, they were running state-of-the-art countersurveillance tests on their internal communications and external communication system and anyone who knows anything about a black operation, which this is, that’s a spying operation that’s run off the books and is deniable, that the first thing you do when you organise these, you give yourself and exit strategy. And if you’re asking me, my worthless opinion, the bits and pieces that they found during these screening tests were the loose ends that those involved in this forgot to tie up and have left a signature which showed that something was going on. But, again, I think you have to go back to this. You’ve a number of issues here: you’ve the comments and the statements that Alan Shatter gave the Dáil yesterday [Tuesday], you have the unprecedented situation where Enda Kenny, the Taoiseach of this State, went off and gave comments that were completely inaccurate about the legislative requirements of the Garda Ombudsman and you have the bizarre situation, like it, it’s just feeding into this problem about the administration of justice, whereby Alan Shatter, for example. 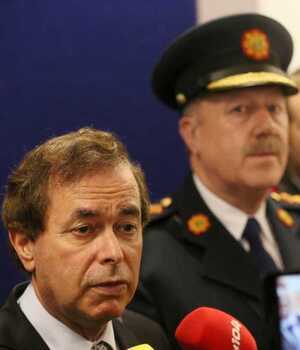 There was information read into the Dáil record about the Confidential Recipient [a transcript of a conversation between Garda whistleblower Maurice McCabe and the Confidential Recipient Oliver Connolly in which Mr Connolly warned Sgt McCabe that Alan Shatter ‘will go after you’], we were trying to seek, to find out, has the Justice Department done anything about this? 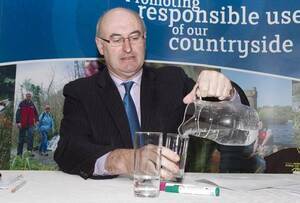 Posted in Misc and tagged Fine Gael, GSOC, John Mooney, Kieran Boylan, Labour, Late Debate at 11:13 am on February 13, 2014 by Broadsheet.